Pele is known as the Hawaiian goddess of fire and lava, and resides on the main island of Hawai’i. As the legend goes, Tutu Pele was born to Haumea (human) to Father Sky. She has many siblings, including the gods and goddesses of wind, waves, ocean, water and clouds. She lived on the Islands of Tahiti, until she grew so large that she could no longer be contained. Tutu Pele travelled through the Pacific Islands searching for a place to rest until she came across Hawai’i. Travelling from island to island, she finally found a place large enough to hold her. – the Halemaʻumaʻu crater. The crater is the summit of the Kilauea volcano, which holds all of the volcanic activity in the Hawaiian Islands. 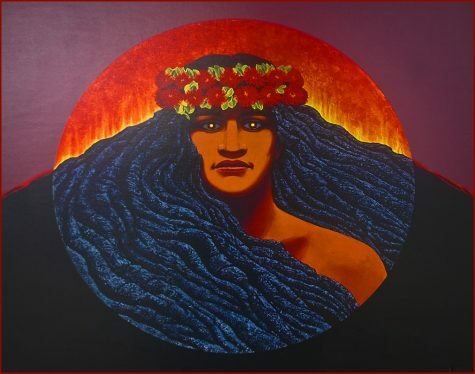 Tutu Pele is known for her power, passion and jealousy, and respected greatly by the Hawaiian people. Many Kahiko (ancient) hula dances come from the peoples great respect for her, and their efforts to keep her happy, in turn keeping their islands safe. It is said that you can find Tutu Pele in her mortal form in a few ways, and if she is disrespected, she could become restless and cause an eruption. It is believed that if you see an elderly woman in a white dress walking her dog, or a young beautiful woman in a red dress walking down the hills in Hawai’i, you must pick them up, because it is Pele in her mortal form. Tutu Pele has lived there peacefully for thousands of years, only erupting a few times. In 1924, Kilauea erupted, killed one person, and sent ash, rocks and dust into the air for 17 days. The volcano is considered to be one of the most active volcanoes in the world. Kilauea has had more than 60 continuous eruptions since January 3, 1983. By April 1983, the eruptions came out of one vent, allowing the lava flows to create a cinder and spatter cone sitting at 836 feet high. The short eruptions created a thick, chunky lava that usually cooled before reaching sea level, but that changed in July 1983 when the lava destroyed the Royal Gardens subdivision. In 1986 the lava flows spread, cooled, and destroyed homes. Kilauea entered its most destructive period in March 1990, destroying more than 100 homes burying them 50 to 80 feet under lava. Many scientists predicted a mega tsunami, but that has never happened before, so many locals and geologists in Hawaii don’t believe it will really happen. This is one of the biggest eruptions since 1924 because the lava lake was continuously rising and falling. 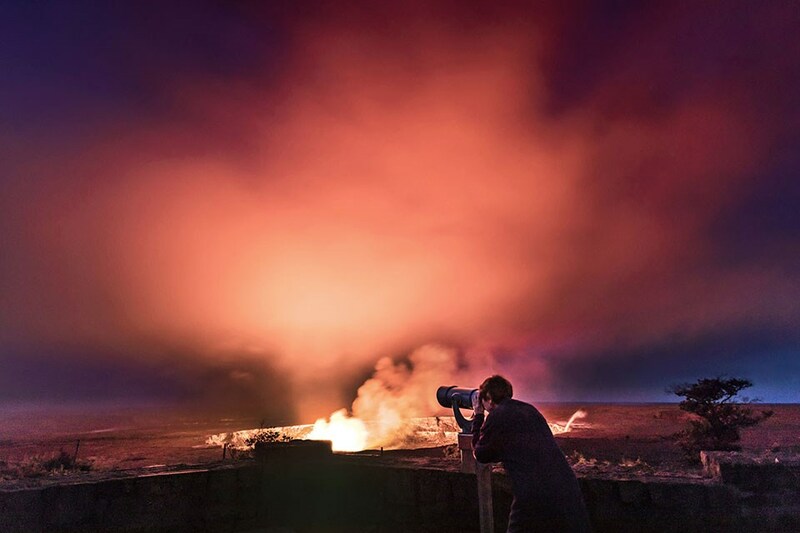 National Geographic reporter, Sarah Gibbens said, “The volcano’s lava lake in the crater has been steadily falling, raising the risk that it could come into contact with the water table and produce steam. As rocks increasingly fell into the crater, it created a cap that forced steam to build up under pressure and eventually explode, scattering rocks and ash. Kilauea hasn’t had a large-scale explosive eruption since 1924, when it sent ballistic rocks the size of refrigerators careening into the air,”. Kilauea is near the ring of fire, which is one of the reasons it has had so many eruptions in the past few decades. Many concerned tourists have come up with events that most likely won’t happen because they’ve never happened before. One of the most unlikely events is a mega tsunami hitting California. Geologist Mika McKennon said, “In Hawaii, there are submarine landslides, and submarine landslides do trigger tsunamis, but these are really small, localized tsunamis. They don’t produce tsunamis that move across the ocean. In all likelihood, it wouldn’t even impact the other Hawaiian islands,”. Two weeks ago, on the third of May, earthquakes began on the Big Island of Hawaii. The earthquakes caused the Halema’uma’u crater to crack, and let out the toxic sulfur dioxide into fissures around the island, spewing it into residential neighborhoods. Multiple neighborhoods have been evacuated, and 22 homes have been destroyed by the lava, reports CNN. Since the beginning of the volcanic activity, Hawaii has been evacuating locals in order to protect them, shutting down multiple schools and businesses. Recent explosions have been steam-driven, until today when lava, ash, and steam shot out of the volcano, forcing those near the volcano to evacuate. In an interview with Kumu Hula of Hula O Lehualani, Kumu says that she has many fears about the activity within Kilauea and Tutu Pele. Her view is similar to many of the Hawaiian people, who fear that they have done something to make Tutu Pele angry, and hope that they have time to make it right before it is too late.